While shopping last week, I noticed some seville oranges in my local gourmet fruit shop. 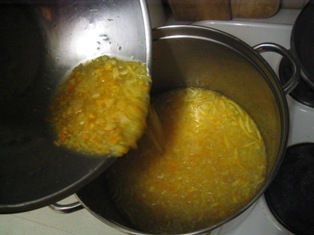 These are famous bitter oranges that lend themselves perfectly to authentic marmalade making. I purchased six. 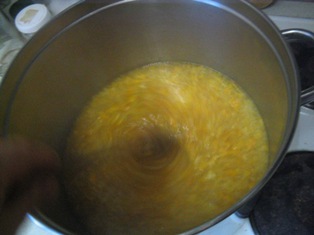 The most marvellous thing about marmalade making is the amazingly large yield. I started with two seville oranges, that weighed 250 grams each. 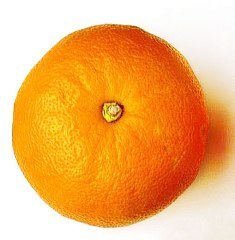 I first quartered the oranges and removed the pips. I chopped the oranges roughly and threw them in a food processor, along with one medium-sized de-pipped chopped lemon, shredding them all finely. I deposited this fruit pulp in a large bowl. I took the remaining seville oranges that I had bought and juiced them. I added two cups of orange juice to the pulp, along with four cups of water. I placed all the orange and lemon pips into the soaking pulp also. I left the bowl sitting overnight, though the recipe did not specify doing that. Next morning I poured this pulpy mass and all the liquid into a large saucepan, and placed it on full heat. I brought the mixture to the boil, reduced it to a simmer and cooked it for one hour with a tightly-fitted lid. 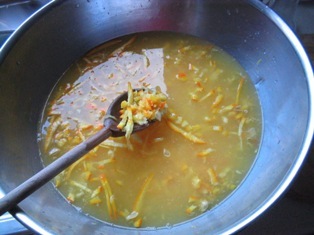 This is the first stage of marmalade making: softening the fruit. 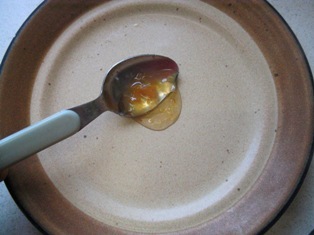 As it softens, the pectin content from the fruit pips and lemon pulp is introduced into the mixture. This natural pectin is what will eventually set the jam. After one hour, I checked the pulp; it was very soft. Now came the most important part. 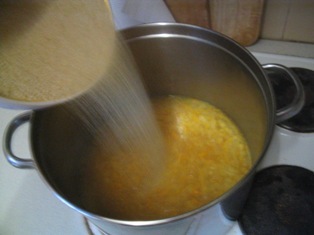 I added 1.5kg of sugar to the simmering softened pulp. I used raw sugar, which works very well. I turned up the heat to full, stirred the sugar and pulp mixture as it returned to full boil, then left it boiling hard for 25 minutes on full heat, without stirring. After 25 minutes the marmalade looked dark and jammy. To test whether it was ready, I took a teaspoonful of mixture and placed it on a small plate that had been chilling in the freezer. I popped it back in the freezer and left it for one minute. This is a critical step. 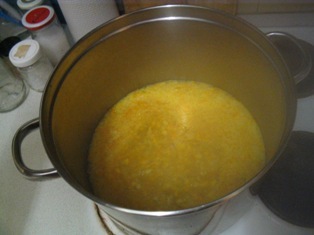 If the marmalade overcooks it will be very dense and firm. If it needs more cooking, the end result will be runny. 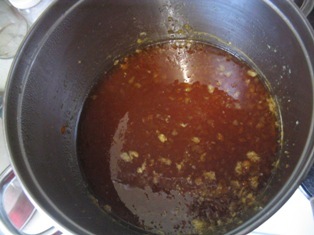 At this stage you must decide whether to keep the marmalade on the heat for a little while longer, or remove it. It can be tricky to tell because it is still a molten liquid. 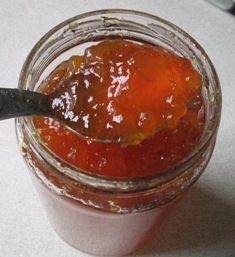 And remember – in marmalade cooking there is only about a 5-minute window between a runny end-result and something which will be too heavy or crystallised. 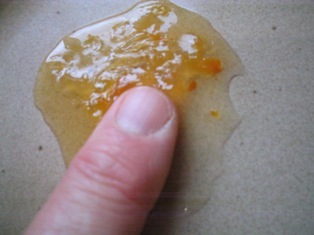 I took out the cold plate and pushed my finger gently through the marmalade sample. It left little wrinkles in its wake. This was a sign that the marmalade was done. Off the heat! 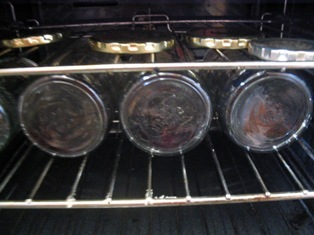 I had sterilized and heated some glass jars as well as their metal lids in the oven, and they were hot and ready. After taking the marmalade off the heat, and allowing it to cool a little for 10 minutes, I poured it through a large funnel and filled my jars. 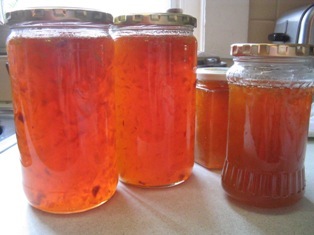 Look how much marmalade I made from 2 oranges, 1 lemon, 2 cups of orange juice, 4 cups of water and 1.5kg sugar – 3.2kg of marmalade!! Those large jars weigh 1.2 kg, (over 4.5 pounds) including the jar-weight. And that’s the marmalade above, after setting and cooling in the jars with tight lids for an hour or two. It has a wonderfully intense bitter/sweetness, and vastly better than any shop-bought product. Time to pop on the toast.